Thanks to thirty-three, progressive, savvy women; this organization’s roots were planted in 1925. 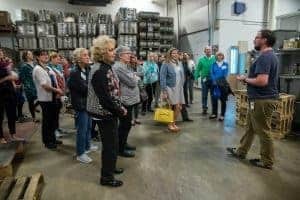 These women were employed by Twin Cities flour milling companies, food service institutions and utility companies and came together to share ideas within a supportive network. In early days the organization was called Twin Cities Home Economists in Business and was under the umbrella of the American Home Economics Association. Today, we are an independent, nonprofit organization with the name Food & Consumer Science Professionals. Like the 1925 charter group, today’s membership thrives by coming together to network along with added opportunities for learning, leadership and community involvement. Plus, we welcome men to our membership ranks. Regular meetings provide members with expert speakers presenting trend or cutting edge information that can be used to impact workplaces and communities. The member’s careers are varied and impressive within the consumer science field including test kitchen professionals, food scientists, business and food marketing professionals, educators, registered dietitians and nutritionists, consumer product specialists, hospitality professionals, kitchen and interior designers, students plus more. We celebrate “the awesome 33” for paving the way to such a vital organization! Food & Consumer Science Professionals (FCS Professionals), is a non-profit organization providing opportunities for members to learn, share and grow, thus positively impacting the workplace and communities. Through high caliber programming, the organization communicates insights and expertise on a wide range of topics and trends: culinary arts and design for business, education, marketing, research, health and wellness, diversity and more! Regular meetings provide occasions to LEARN from experts, be INSPIRED by information that can quickly be integrated into the workplace or community, and CONNECT with professionals from major companies such as Land O’Lakes, General Mills, Lunds & Byerlys, high school and university educators as well as successful small business owners, consultants and marketers. It’s an organization that enables members to energize their career and network with others sharing the same passion. Check us out!